In the last of four interviews - Adrian Scrase, ETSI CTO and Head of 3GPP MCC, talks to Erik Guttman, the 3GPP SA Chairman. Two key Release 14 features from SA. 3GPP progress on multicast and broadcast content delivery over LTE in Rel-14. Release 15 and 5G, with Stage 1 Requirements now published. Adrian Scrase : As Release 14 comes to a close, what are the key features that help pave the way towards 5G? Erik Guttman : I’d name two; the control & user plane separation (CUPS) and enhanced Decor (eDecor) which is for the dedicated core networks, viewing the single core network as having different roles, supporting different kinds of applications and terminals. AS : and how does that pave the way for 5G in particular? EG : These are two of the major design principles for 5G, that will go further than where we are with the enhancements to the existing enhanced packet core (EPC). AS : Of course within Release 14 we have had particular success in working with the broadcast community, could you elaborate a little bit on that success? EG : I would say that there has been support for broadcast for some time, in 3GPP we have a mechanism – system wide – for delivering multicast and broadcast content. However, this has not had wide commercial adoption and success. We have made tremendous progress, in that we will now offer by the end of the Release (14) a standardized interface for broadcasters to provide content, we will have mechanisms within the system to provide profiles to provide direct transmission of content from broadcasters that are using digital standards. We will also offer a broadcasting system for streaming and delivery that complies with a whole set of profiles that are widely adopted by the industry. Lastly – and quite importantly – we have advances on the radio access side which lower the cost and broaden the coverage. These were areas where in the past studies done by the broadcasting community – particularly the EBU – they identified that these were the [3GPP] shortcomings. I have direct experience with that community – from the conference I have just attended – It seems that it is not a question that ‘if’ this technology will be appropriate, but ‘when’ will it reach that point that there will be larger adoption? AS : In terms of Release 14, we can note the good progress made and now we are looking towards Release 15, and the start of 5G. Are we successful in capturing the requirements of 5G – particularly in terms of some of the markets segments where we haven’t been traditionally present? EG : I would say so, there has been quite an effort in terms of 5G requirements where we have obtained information from the national research institutes and national initiatives… and all of these requirements have been brought in and the use cases synthesised and harmonized and we are right at the verge of completing our Stage 1 requirements specification. AS : We know that there is an awful lot of work that needs to be done to complete that system description, but we don’t have a lot of time to do it. Are you confident that we can meet the timelines that some of the world’s operators are placing upon us? EG : I think so, the 3GPP community really focuses on results and is able to make decisions on a quite rapid basis once the goal is in sight. It may be in some areas that we don’t meet all of the goals set out, but we will adjust to that and continue – This is not a one Release project – 5G will be with us for many years to come. So, this is a piece-by-piece approach and I am confident that the most fundamental aspects will be addressed by the September 2018, full freeze date. With Adrian Scrase, ETSI CTO and Erik Guttman, 3GPP SA Chairman. 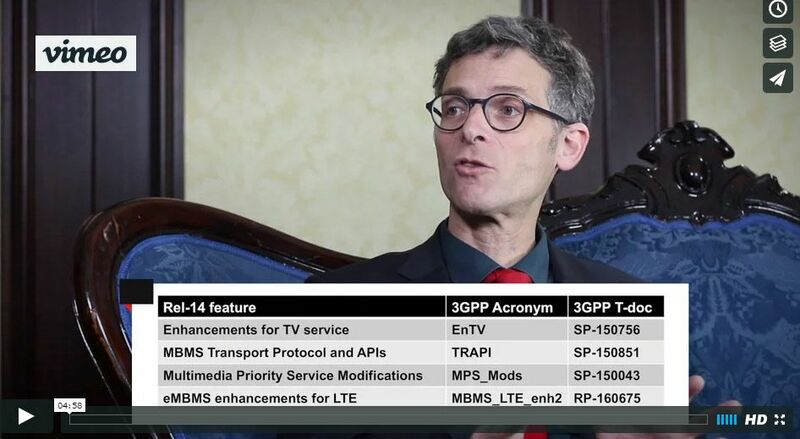 Adrian Scrase (AS): As Release 14 comes to a close, what are the key features that help pave the way towards 5G? Erik Guttman (EG): I’d name two; the control & user plane separation (CUPS) and enhanced Decor (eDecor) which is for the dedicated core networks, viewing the single core network as having different roles, supporting different kinds of applications and terminals. AS: and how does that pave the way for 5G in particular? EG: These are two of the major design principles for 5G, that will go further than where we are with the enhancements to the existing enhanced packet core (EPC). AS: Of course within Release 14 we have had particular success in working with the broadcast community, could you elaborate a little bit on that success? EG: I would say that there has been support for broadcast for some time, in 3GPP we have a mechanism – system wide – for delivering multicast and broadcast content. However, this has not had wide commercial adoption and success. AS: In terms of Release 14, we can note the good progress made and now we are looking towards Release 15, and the start of 5G. Are we successful in capturing the requirements of 5G – particularly in terms of some of the markets segments where we haven’t been traditionally present? EG: I would say so, there has been quite an effort in terms of 5G requirements where we have obtained information from the national research institutes and national initiatives… and all of these requirements have been brought in and the use cases synthesised and harmonized and we are right at the verge of completing our Stage 1 requirements specification. AS: We know that there is an awful lot of work that needs to be done to complete that system description, but we don’t have a lot of time to do it. Are you confident that we can meet the timelines that some of the world’s operators are placing upon us? EG: I think so, the 3GPP community really focuses on results and is able to make decisions on a quite rapid basis once the goal is in sight. It may be in some areas that we don’t meet all of the goals set out, but we will adjust to that and continue – This is not a one Release project – 5G will be with us for many years to come. So, this is a piece-by-piece approach and I am confident that the most fundamental aspects will be addressed by the September 2018, full freeze date.